Getting the best flavor from your tea isn’t hard, but here are a few tips to help just to make sure. What you’ll need: teaspoon/tablespoon, infuser (tea ball) or paper tea filters plus your tea, teacup, teapot and a container to boil the water. First, start with a clean container to boil your water – good fresh water. Ideally, you don’t want to microwave the water. Truly there is a difference in the flavor, quality and energy of the water when you do. I did a taste test when I first got into high-quality, gourmet teas and I could definitely taste the difference. Give it a try and see what you think. Second, measure the proper amount of tea and put it into your tea infuser – ball, filter or strainer. Refer to the chart below, but normally white, oolong and herbal tisanes take 1 tablespoon, while green and black only need 1 teaspoon. Pack the tea leaves loosely in your infuser or filter bag. You want the hot water to flow through the leaves. If you plan to use a paper filter, don’t use a coffee filter. Their heavy paper will absorb too much of the flavor. Instead, purchase filters designed specifically for tea. If you desire stronger tea, steep more tea leaves, instead of brewing for a longer time, which can make a bitter cup. When using tea bags, refer to the same water temperature and steep times as listed below. 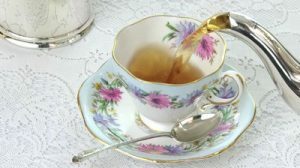 However, I encourage you to think about using loose tea in the future – I think you’ll like the fuller flavor, and it actually doesn’t take any longer to prepare. When the time is up, remove the tea from the water. Do not leave it in your cup or teapot as it will get bitter. Most tea leaves can be steeped a 2nd time, and sometimes even a 3rd time, for a delicious yet different resulting brew. I usually make 3 cups from my blend, Festivi(ty). I like the different flavor that each cup delivers! Don’t worry if you don’t get a dark brown color. White and green teas usually produce a much lighter colored brew. And, some tisanes will produce a colorful drink reflecting the herbs used. Now, here comes the moment you’ve been waiting for. Pour your fragrant, freshly-brewed tea into a favorite cup. Sometimes I like a proper English Bone China teacup, while other times I enjoy holding an Asian style cup – especially in the cold winter! If you can, take time to savor the aroma and the taste. One of the reasons I love drinking tea is that it invites me to enjoy those first few moments when the tea is just ready to drink. I can’t always stop and take pleasure in the whole cup, but I try to as often as I can. I hope you will too! 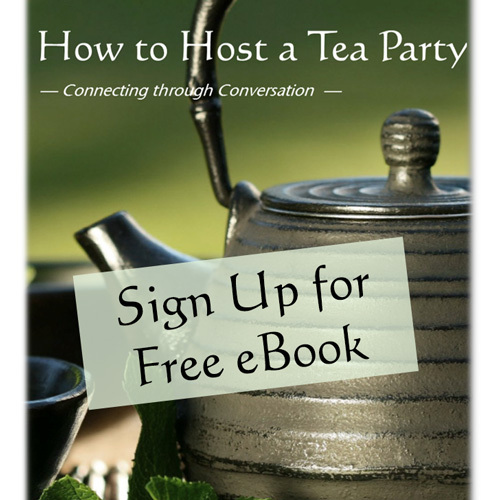 Tea begs to be served…so invite some friends over for a delicious cup or two. Talk about something interesting and enjoy!